Welcome to the first drawing lesson of August! 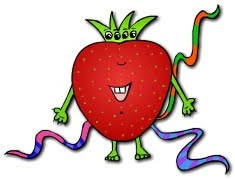 This week, we will be learning to draw The Strawberry Monster! The Strawberry Monster is a chatterbox. She loves heights and has a blue car. She has three tails too. She also has a cute bellybutton! Jenna W. from West Virginia sent in this fun talkative monster! You will be seeing The Strawberry Monster coming soon in Murb! Thanks Jenna! Step 1: Draw Strawberry's head. Step 2: Add in her fun crown-shaped topper. Step 3: Draw her face and bellybutton. She has a happy smile with two teeth showing and a cute little curve for her nose! Step 4: Draw her 4 eyes. Don't forget her eyebrows! Step 5: To draw her arms, simply draw two straight lines from each side. Step 6: Each hand is made up of four curves. Connect them to her arm and add little lines for claws. Step 7: Using straight lines draw her legs and the beginning of her feet. Step 8: The Strawberry Monster only has 4 toes. Draw each one by drawing a little circle. Step 9: Now add in Strawberry's fun curvy tails! She has three of them. 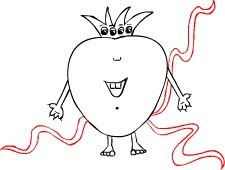 Step 10: Now color your Strawberry Monster! Have fun drawing The Strawberry Monster. Make her tails any design you want and then send me a picture of your drawing! I would love to see it!